After playing Assassin’s Creed IV: Black Flag, a lot of us here at GodisaGeek agreed that one of the most improved aspects of the title was with the naval warfare. Whether that’s because of the subject matter – there’s nothing quite like setting out on the open seas as a pirate – or whether there were some behind-the-scenes, subtle changes to the way things work, getting out there on the ocean in Assassin’s Creed IV: Black Flag was a special experience. With that in mind, imagine our excitement when we heard about Ubisoft Paris putting together a standalone Assassin’s Creed experience for iOS devices which centred wholly around being a pirate on the high seas, taking down British ships, Spanish ships and anyone else who crossed the path between you and your treasure. Assassin’s Creed: Pirates puts you into the same location as Assassin’s Creed IV: Black Flag: the dangerous waters of the 18th century Caribbean, only this time you’re neither an Assassin nor a Templar; simply another pirate attempting to make his murderous way in the world, named Alonzo Batilla. Despite not actually playing as one of the main factions from the franchise – which instantly feels odd given that the title of the game mentions assassins – you will come across both Templars and Assassins while you’re performing the various missions available to you. The game puts you in command of your own vessel – which changes as you upgrade through the levelling system – and lets you loose onto the ocean to, essentially, make your own way. Similar to how the main games in the Assassin’s Creed series work, the world is open, allowing players to go where they want, when they want, but there’ll always be a main “Memory Sequence” – a mission for you to complete in order to progress through the game. The rest of the missions revolve around either taking down an opposing faction’s ship, or steering your own ship through a series of checkpoints within a time limit. As has become customary in Assassin’s Creed games, there are a few secondary objectives to be completed within each mission in order to 100% sync each of the memories. These will often involve completing the mission in a certain time limit, or doing so without taking damage, but as long as you complete the main objective, you’ll be able to continue through the story without hindrance. 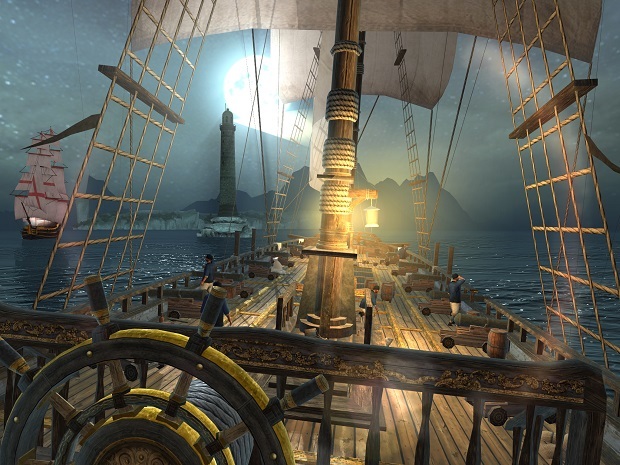 The controls in Assassin’s Creed: Pirates are easy to get used to. The screen is basically divided horizontally across the centre. Swiping your finger across the bottom half will rotate the ship’s wheel, allowing you to change the direction you’re going in, and swiping your finger across the top half will allow you to look around without changing the direction of the ship. This is especially useful when you suspect that an enemy may be in the vicinity and you just want to attempt a quick glance in order to find out. As well as the basic movements, you’re also able to pinch and pull on the screen in order to change the view between looking from behind the entire ship, or just looking from behind the wheel. If you pinch the screen to zoom while you’re already looking from behind the wheel, then you’ll even be able to get the spyglass out – even better for spotting those pesky British lurking around the many smaller islands that litter the Caribbean. Combating the other ships that pepper the ocean is the main draw in Assassin’s Creed: Pirates. While the iOS devices aren’t capable of the battle intricacies of their console brothers, this doesn’t mean that each fight isn’t exciting. 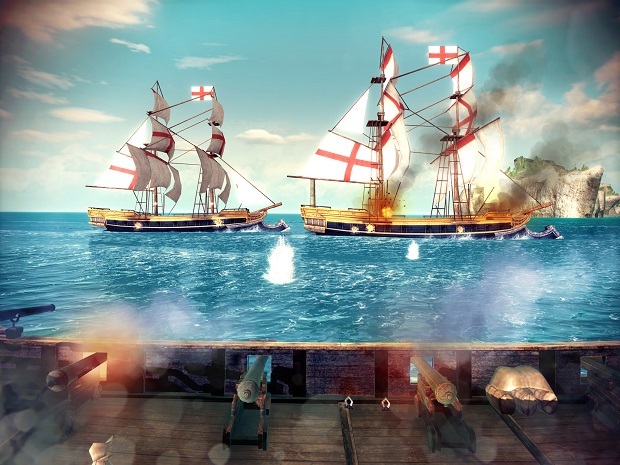 The ships will face each other’s broadside, before firing their cannons upon one another. The cannon fire is on a cooldown – allowing the men to reload after firing – so it’s a game of tactics to try and fire more cannons than the opponent. Sometimes, after a successful cannon hit, you will have exposed some of the more critical areas of the opposing vessel. Once these appear (you’ll notice them as a red cross-hair) you can fire your swivel guns at them in order to deal out a massive amount of damage. When being attacked by the opponent, you’ll find yourself in a different mini-game, one where you’re tasked with simply dodging the opponent’s cannon fire. 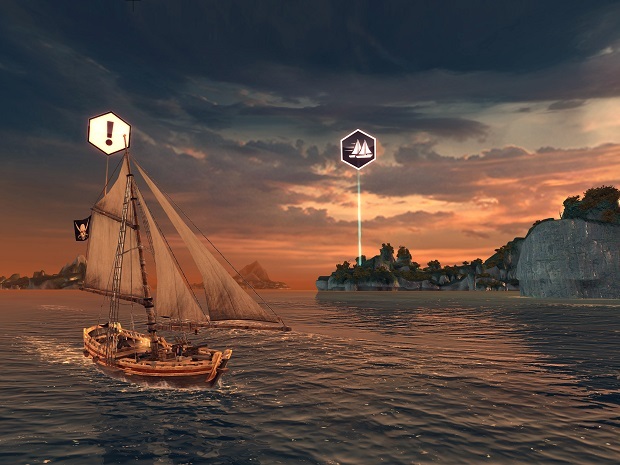 With this, you’ll see a bar along the ocean which indicates when the opponent will fire, and there will be a button at the bottom left and right of the screen which allows your ship to dodge left and right. The aim of the game is to sink their ship without taking damage to your own – obviously – and tactical use of both the offensive and defensive abilities of your ship are a must if you intend to come out on top. VERDICT: Assassin’s Creed: Pirates is a very good mobile game, whether or not it has the Assassin’s Creed title in it’s name. The story is interesting and moderately compelling, and lasts a decent amount of time to boot. The missions can feel a little bit easy and overly repetitive, but when you’re just playing it in 30 – 60 minute chunks, it doesn’t feel as bad as it otherwise might. Ubisoft Paris have done a good job with the visuals, too, making sure that the game’s world looks believable and immersive but still running well on mobile devices. There are small issues with the graphics, such as the water often appearing inside the ship, but the positives far outweigh the negatives. The price point might turn some people off, especially those who only find themselves playing casual games on their iOS devices, but mobile gaming is – whether you like it or not – where at least part of the games industry is going. Assassin’s Creed: Pirates shows exactly what it’s capable of doing. By day I play video games, test video games or just simply write about them. By night I fight crime on the streets of London as a masked vigilante known only to a select few ... damn SECRET identity. Could never get the hang of that. I've been writing about video games for about 10 years now, and playing them for even longer, starting off with a Spectrum ZX passed down to me in about 1988. Yes, I used to play games that came on cassettes. Yes, they were AWESOME! I've been writing for God is a Geek since October 2010 and loving every minute of it, aside from that I write for my own website and work as a video game tester for Testology. So, yeah, I'm pretty much living the life of a gamer, and I don't intend stopping anytime soon thank you very much. Unless I run out of money, then we might have a problem.